Forks Meal Planner - Help & FAQ - Can I add or edit items/ingredients within my Grocery List? All Categories ​>​ Customizing Meal Plans ​>​ Can I add or edit items/ingredients within my Grocery List? Can I add or edit items/ingredients within my Grocery List? Enter in any item/ingredient into the appropriate entry bar, choose an aisle/section from the dropdown list, and click add. The ingredient will then show up on your Grocery List (just like your meal plan menu's ingredients). If a new aisle/section is added, it will show up at the bottom of your list. You can click on the "..." to the far right of any ingredient to access the "Edit quantity" button. 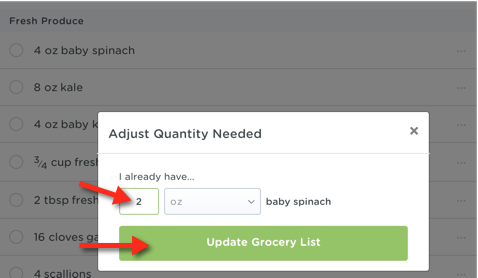 In the "Adjust Quantity Needed" prompt, enter in the amount you already have on hand and click "Update Grocery List." The adjusted quantity will show, though you may always edit further or reset the quantity. 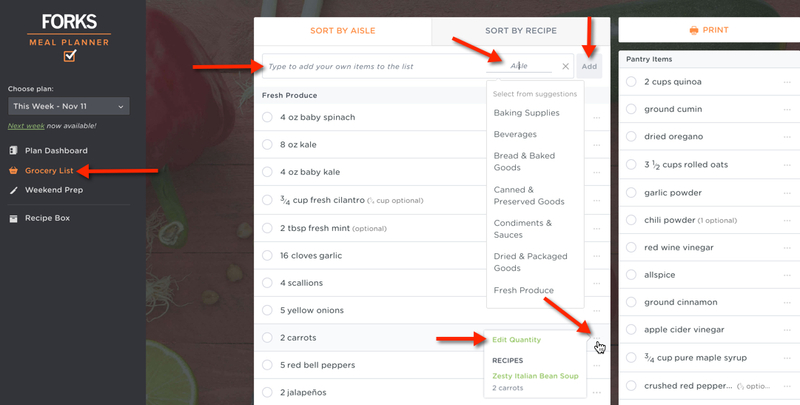 When I swap in a recipe, does my weekend prep and grocery list update automatically? Can I view the ingredients in metric measurements?